this comes to us via Syrie James @Avon, an imprint of HarperCollins Syrie James’ novel Dracula, My Love. Misty won Caramel! Heather(!) won one of Mighty Distractible's embroidery kits! From this month's incentive drawing! Don't forget Knitcircus—To get on the mailing list for the BRAND NEW free newsletter, please visit knitcircus.com. The Hair Clip Cap pattern out now, and a new pattern goes out next week! CraftLit! Just the Books! Featured in the Podcast Box! We just added a featured tab to the Podcast Box app. Every couple weeks we will be featuring different producers' apps and this week your app has been chosen! Being featured makes it super easy for new listeners to discover your show so make sure you release some fresh content. 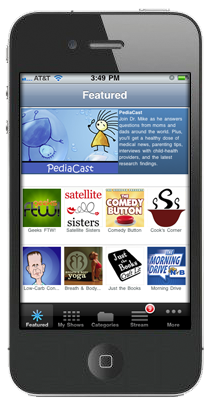 Tell your audience to download the FREE Podcast Box app... your show will be front and center when they launch it!Just the Books for Droid, here. CraftLit for Droid here. Again, many thanks to Jon Scholes at Vaguenet, and Ehren Ziegler at Chop Bard, and Elizabeth Klett for our audio this week! Just the Books is now paralleling CraftLit in real time—for Dracula. We'll be uploading the books between Pride and Prejudice and The Woman in White as time and storage space allow. AND the CraftLit Family page is up and growing! Add what you're up to there and share your "betterness".